You transfer cash or securities to the American Cancer Society . Beginning on a specified date in the future, the American Cancer Society begins to pay you, or up to two annuitants you name, fixed annuity payments for life. The remaining balance passes to the American Cancer Society when the contract ends. You must be at least 60 to begin receiving payments. The minimum gift requirement is $5,000. 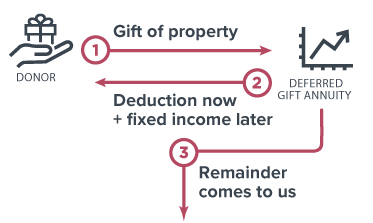 More details on deferred gift annuity. Frequently asked questions on deferred gift annuity.